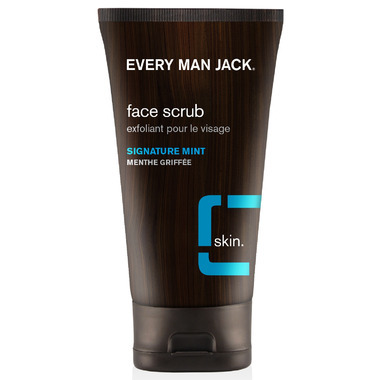 Every Man Jack Face Scrub helps to remove deep-down dirt and oil, leaving skin clean and hydrated... and in great shape for a perfect shave! It is made from Coconut-derived surfactants to gently clean, natural extracts and Vitamin E to soothe and moisturize. The face scrub also contains jojoba beads that will remove dry and dead skin. Ingredients: Aqua/water/eau, cocamidopropyl, betaine, polyethylene, sodium cocoyl isethionate, glycol distaerate, acrylates/c10-30 alkyl acrylate crosspolymer, PEG-7 glyceryl cocoate, glycerin, jojoba esters, crithmum maritimum extract, chondrus crispus (carrageenan) extract, mentha piperita (peppermint) leaf extract, tocopherhyl acetate (vitamin e), bisabolol, allantoin, panthenol (vitamin b5), dimethicone PEG-8 benzoate, polysorbate 20, sodium hydroxide, citric acid, caprylyl glycol, sodium phytate, phenoxyethanol, fragrance/perfume. Love the fresh scent of this product and the natural ingredients. Bought this for my son. My son loves this face cleaner! He's tried many other cleaners and this is his favorite. Leaves a clean and fresh sensation, works best with silicone pore scrubber! Also great for skin care routine! This leaves my skin feeling soft and refreshed! Although my girlfriend said that it sort of smells like women's foot scrub, I find the product works great. Bought this for my husband. HE likes the fresh mint scent and says it does a good job on his face. Bonus is that it is eco friendly as it doesn't have plastic microbeads.